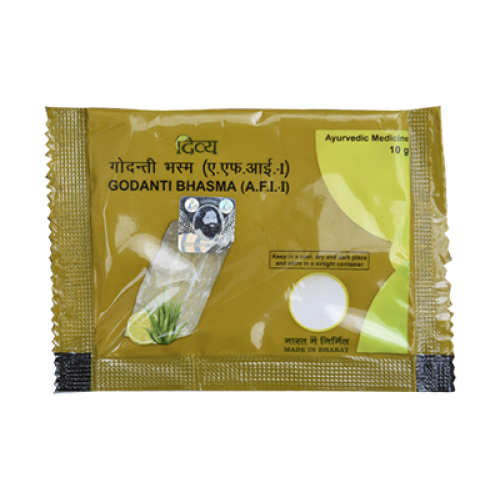 Godanti Bhasma is a potent combination of natural and plant extracts that are rich in calcium and other minerals. Nimbu contains Vitamin C which cures cold, cough, fever and increases immunity. Ghritkumari has multiple benefits. It detoxifies, soothes and heals your body from ailments. GodantiBhasma is an ancient Ayurvedic formulation and has no side effects. It is helpful in curing long-lingering problems. Do not be bogged down by headaches, cough and fever. Take GodantiBhasma regularly to experience lasting effects of Ayurvedic healing.